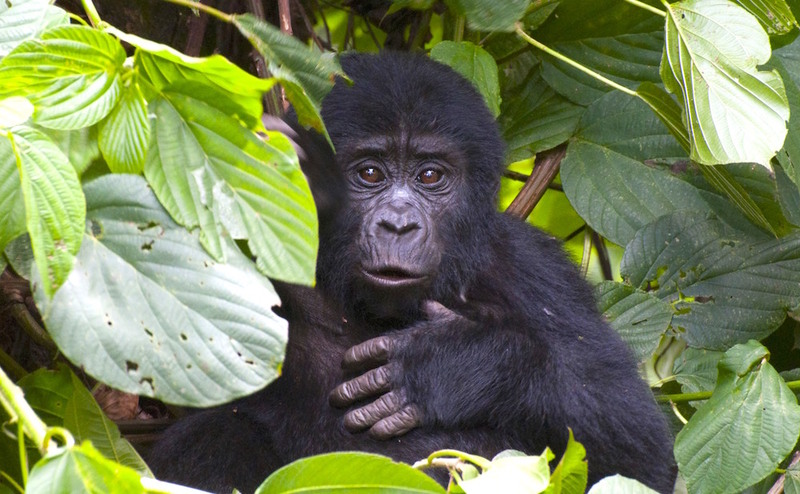 Mountain gorillas communicate through vocalisations and physical gestures and movement. Of these sound is less important. Gorillas are always aware of group activities and take their information and signals primarily from this source. Sound, especially contact grunts, is very important for group cohesion and coordination in an environment where members of a group often can’t see each other for long periods. While gorillas can be noisy, these sounds are not necessarily symbolic but purely express emotion, i.e. when content, anxious or angry. Some vocalisations are warnings, which cause the troop to congregate around the leader for further instructions, imparted physically. They have at least 25 vocalisations including roars, grunts and growls. There are also variations in pitch, intensity and pattern, which also provide context. A few lowland individuals in captivity have been taught a subset of sign language, like chimpanzees. I encouraged Reuben to show off a little and entertain our guests with his star act, ‘Old Silverback’, a clever imitation. He started shyly and quietly but soon forgot himself, hooting and clicking full blast. Instantly from up the hill came the response, “hu, hu, hu, hu,” in high falsetto, followed by the wooden “click, click, click, click”. A cordial to and fro went on for a while between original and imitator, then an infant, apparently disturbed in its sleep, began to whimper like a puppy that had not yet learned properly how to bark. Eventually the mother’s voice, trying to calm the child joined in. One individual would start a low rumbling sound, breathing loudly in and out in a modulated tone. This might remain a solo performance and last no more than a minute. Often, however, others would join in, adding gender- and age-specific basses, baritones, tenors and sopranos to the mix. The result was a chorus of intertwined melodies, rising and falling in natural rhythm that might continue for several minutes: a gorilla Gregorian chant in the Virunga cathedral.